I'm not sure if all the exercise that I've been doing since January has finally started paying off or if it's the glassful of super healthy chia seeds I've been drinking every morning before my runs, but I've been feeling really good lately. Just in case it is the chia, I've been finding ways to get more of it into my body. So I've been working on perfecting chia jello. Not using the boxed stuff, but real fruit juice, so I can tell myself that it's actually good for me. And I think I've finally got it. -Add the 3/4 cup of juice to the seeds and stir well. -Let sit for 3 minutes and then stir again. Now let it sit in the fridge for an hour or two to give the seeds time to plump up. 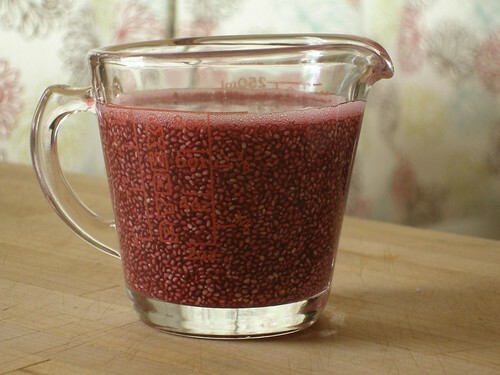 -Remove the chia and juice from the fridge and stir well, making sure there are no clumps. -Put the 3 cups of juice in a pan and heat til boiling. 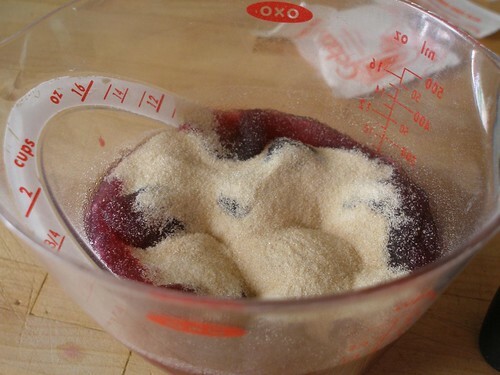 -While the juice is heating, sprinkle the gelatine over the 1 cup of cold juice. -Let sit for a minute and then stir til it's nice and smooth. 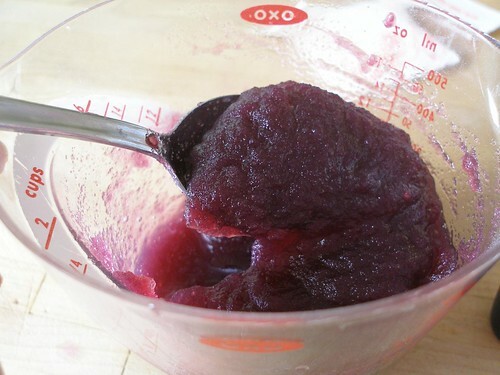 -In a heatproof bowl (or the pan itself), mix the boiling juice in with the gelatine and juice and stir for 5 minutes until all of the gelatine is dissolved and the mixture has cooled down somewhat. 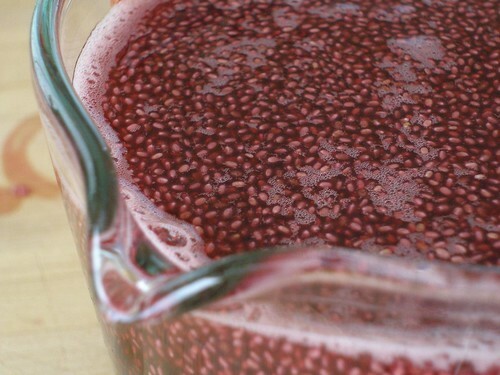 -Now add some of this liquid to the chia seeds, maybe a quarter cup at a time, stirring well after each addition. This thins the mixture and keeps it from clumping when it's all combined. 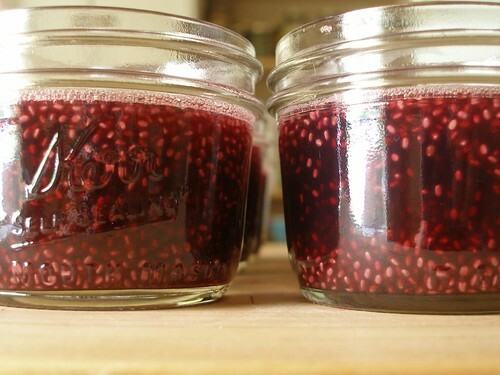 -Stir the thinned chia seed mixture into the rest of the liquid. I used wide mouth half pint jars because I liked the idea of making individual serving sizes. I was guessing that they'd be handy to pull out of the fridge after each day's run, and you know what? I was right. So, about a week ago, as my science camp students and I started up a Chia Spongebob (comparing it to chia seeds on a regular old sponge), we wondered what chia seeds are, exactly... And now, I'm even more curious! Where can you buy chia seeds? Without buying a terracotta pet to go with them, of course? CJG, I found mine at the local health food store in the bulk section (two or three bucks for a smallish sized bag). They've also got them in the supplement section under the brand name Salba. If you go back and read the first post that I did about these, there's a link to the nutritional information, which is pretty impressive for such a small amount of seed. I'll go update the post to link to it right now. 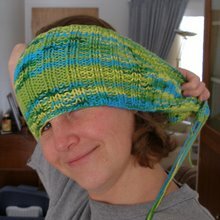 This is so fun! I love how the jello looks like a giant raspberry with the red juice and chia seeds in it. Just curious: what flavor juice did you use? Those little chia seeds seem quite like the little nutritional things. I'm glad you are experimenting more with them. Thanks, Wendy! I'll check out the link and maybe stop at the local health food store this afternoon. I'm looking for some healthier snacks, and this sounds like the ticket! that looks like raspberry jam. I don't know anything about Chia seeds. Kellan, drinking them isn't bad, even our kids do it. You should give it a go one of these days! 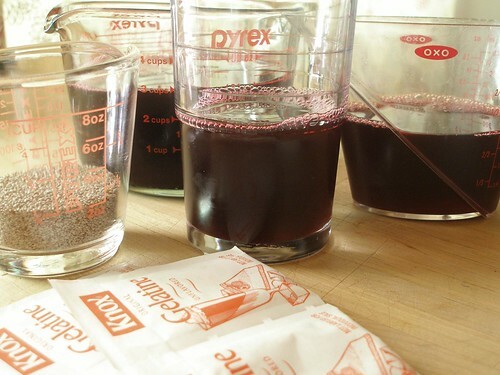 Karin, I used grape juice because that was the only concentrate I could find at the grocery store without any added ingredients. Gil, as soon as I poured them into the canning jars, they definitely started to remind me of raspberry jam as well. I give up. I'm buying chia seeds. The whole thing looks too enticing to resist. And that is something about myself I never knew. That I could be enticed by seeds. Thanks so much for this recipe! I've been doing chia, lime, honey and water, and while it's delicious the texture is, er, a challenge. I'm thinking raspberry-pomegranate juice would be delish. Canada’s Premier Web Marketing /SEO /SMM /SEM Company!